ABA Dry Air Cleaners l Vortox Air Technology, Inc. The ABA dry air cleaner is designed for vertically mounted applications where a horizontal (side) outlet mounting flange is required. The flange allows direct mounting of the air cleaner to an inlet system without additional mounting hardware. All ABA style air cleaners are multistage in design, which removes the heavier dust particles and forces them into the bottom cup due to the vortex motion that the spinning air creates. An internal disc design prevents back flow by keeping the dust captive in the cup. Most ABA styles are available with or without ejection valves. If an ejection valve is not used, manual cleaning of the trapped dust is required. 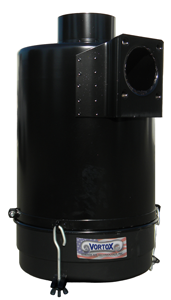 Each ABA air cleaner is constructed of rigid and durable Electro Galvanized coated Carbon Steel and finished in a black polyester powder coating. All ABA style air cleaners are made to accept Vortox Air Technology Inlet Caps, which remove large debris in the air and serve as a shield against rain. Vortox Air Technology Dry Air Cleaners are designed to protect your equipment and keep it performing to maximum efficiency. Superbly engineered and constructed to offer an extended service life of each replaceable filter element by utilizing a design philosophy which minimizes restriction losses. In addition to the distinguishing rugged construction, Vortox Air Technology air cleaners also utilize Deep Draw Technology, which creates a seamless unit, where possible. Vortox Air Technology multistage Dry Air Cleaners use technology to maximize the efficiency of the first stage, prior to dusty air entering the filter element. This extends the service life of our filter elements, which means fewer filter changes for you.